The compass plant (Silphium laciniatum) is an archetype of the prairie. (It is part of the logo of the Prairie Enthusiasts.) It should be included in the seed mix for every planted prairie. The compass plant is one of the most conspicuous plants of the so-called tallgrass prairie. With favorable growing conditions, its flower heads are often over 8 feet tall. The compass plant is a very deep rooted plant, with roots extending 6 to 12 feet underground. 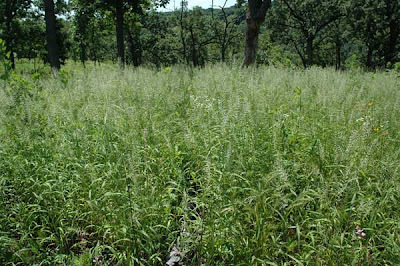 In the first years of a prairie planting, only one or a few leaves are visible, while the root system is becoming established. Except under extremely favorable conditions, flowering will not occur until the fourth or fifth year, sometimes even longer. Once established, however, the compass plant is very long lived. We have had excellent success with compass plant in our planted prairies, and it is also thriving in the open areas of our savannas. It has also turned up in unexpected locations. The photo here shows it growing right next to our driveway. How did it get there? In this location it is actually part of the Valley Prairie, which was planted in the fall of 2002. At that time, our driveway was a narrow dirt strip. Later, as our restoration work got more intense, we had to have the driveway graveled. This is the first year that this prairie (now in its seventh growing season) has had flowering compass plants. In one of our other prairies, compass plant (as well as its cousin prairie dock) has managed to grow through a heavy coating of gravel and send up a vigorous flowering stock. Never underestimate the power of the prairie (or prairie plant)! Mid July is supposed to be the best time for cutting sumac, and this is what we are doing. Because we are cutting new shoots, they are not very woody and are relatively easy to cut. Each person has his or her own favored method for cutting sumac. I use two methods. Hand clippers: Because many of the stems are soft, they are easy to cut with a hand clippers. I grab the top of the shoot and pull it back so that the bottom of the stem is exposed, then stoop and cut the stem as close to the base as possible. Parsnip Predator shovel: A quicker way, which eliminates stooping, is to cut the stem with the sharpened tip of a Parsnip Predator. For the younger shoots, I use the shovel itself to pull back the stem, and then slide the tip down to the base, pin the stem between the shovel and the ground, and then push hard. The stem usually snaps. If the stem is older and larger and perhaps a bit woody, then pin the base of the stem on the ground with the shovel and then step sharply on the foot guard. Most of the clones we are cutting are fairly large. I timed myself today and found that it took 45 minutes to cut a clone that had about 220 shoots, which is 4.8 shoots per minute. Why aren't we using a brush cutter? There are lots of "good" plants growing in and among these sumac clones, and we want to protect them. It is hard to be selective using a brush cutter. For really large clones, we are hauling the cut stems to a brush pile, but for most of the clones we are just leaving the cut stems lay. They shrivel up fairly quickly and do not affect the growth of the good plants. Beautiful orchid in the Valley Prairie! We had a great field trip yesterday, with 14 people plus leaders. The weather was cool and pleasant, and mostly sunny. Gary Birch, one of our trip participants, made an exciting discovery in the Valley Prairie, the stunning specimen of the lesser purple-fringed orchid (Platanthera psycodes) shown in the adjacent photo. 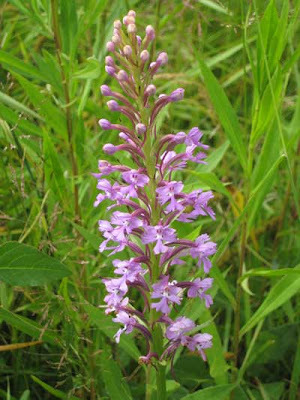 According to the UW Botany web site: "This is perhaps the most beautiful orchid in the Wisconsin flora. If it could be cultivated successfully, it would make a wonderful addition to any garden. Unfortunately, attempts to asymbiotically propagate Platanthera psycodes have been largely unsuccessful." How did it get in the Valley Prairie? This is a planted prairie now in its 7th growing season and this orchid was certainly not in any of our seed mixes. We have never seen it at Pleasant Valley Conservancy, but it certainly must be growing somewhere nearby. It is a wetland species which grows primarily in sedge meadows. 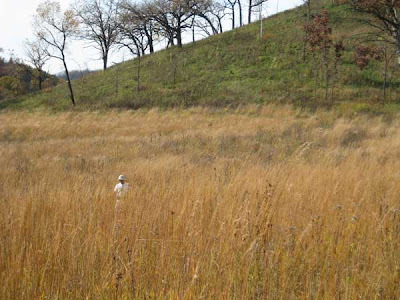 The Valley Prairie is adjacent to our extensive sedge meadows, so we need to make a careful search for it. We have been very pleased with how well the Valley Prairie has developed. Because the lower part of this prairie is adjacent to our extensive sedge meadows and cattail marshes, wet and wet-mesic species are thriving. This year for the first time we have compass plant and prairie dock in bloom, and the latter is especially thriving. Other wet-mesic species that are growing very well here are cream gentian, Culver's root, cup plant, great St. John's wort, gay feather, cord grass, and bluejoint grass. The upper part of this prairie, near the road cut, is of dry-mesic character, and there we find lots of butterfly milkweed and compass plant, plus little blue stem and side oats. 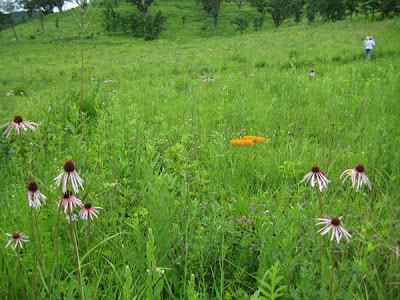 In the middle is a large population of pale purple coneflower. Quite a contrast across a rather narrow strip of land. We do have to monitor for invasives, including both yellow and white sweet clover and wild parsnip. Hopefully, our new found orchid will in time spread farther. And perhaps we will find where in our sedge meadow it is currently hiding! Yesterday Ann Thering battled a windy day to check for wetland skippers. She kindly sent me an email report. Among her finds was a Dion Skipper (Euphyes dion), which is Special Concern in Wisconsin. The Dion Skipper is a wetland obligate, and is found in small colonies in marshes or meadows. In Wisconsin its host plants are sedges, including wool grass (Scirpus cyperinus) and lake sedge (Carex lacustris). According to Ann, the Dion was fighting over a flower of swamp milkweed (Asclepias incarnata) with Mulberry Wing (also Special Concern) and Black Dash Skippers (both also wetland species). We have always had small amounts of swamp milkweed at Pleasant Valley Conservancy, but never really a lot. I guess we should plant more! The wetland area at Pleasant Valley Conservancy is quite accessible, as we have a mowed fire break that separates it from three planted prairies (Valley, Barn, and Crane Prairies). You can walk over a half mile along this route and view wet and wet-mesic prairies on one side and spring-fed sedge meadow wetlands on the other side. This year all of the planted prairies are in great shape. The wetland is also high quality, although it needs to be burned again (FWS burned it in 2005). Thanks, Ann, for all your butterfly work! Monday the Wisconsin Prescribed Fire Council met at the UW-Madison Arboretum. As a member of the Board of the Council, I attended this meeting. The morning session was a roundtable discussion about the past spring's burn season. About 50 people attended, including representatives from most agencies involved in prescribed burns in Wisconsin, including the Wisconsin DNR, the U.S. Fish and Wildlife Service, the Prairie Enthusiasts, Nature Conservancy, Pheasants Forever, etc. etc. The spring burn season was complicated this year because of extensive periods of low relative-humidity conditions. Many burn prescriptions specify that the R.H. must be above 25%, yet this spring R.H. values were often considerably below that, necessitating calling off burns. Some participants noted that 25% was a somewhat arbitrary lower limit, and depending on wind speed, direction, fuel type, and other factors, burns could have been safely done. The discussion ranged widely, and many other issues regarding prescribed burns were presented. An important issue was the permitting system that operates in many (but not all) parts of Wisconsin. In many areas of the state, special permits are needed to conduct daytime burns, and authorization to burn requires verbal approval on the day of the burn. Although this permitting system is well organized and works well, it still presents considerable problems for prescribed burners. Most prescribed burns require extensive crews and a large amount of equipment, all of which has to be transported on the day of the burn to the burn site. If the authorization is then not forthcoming, the expenses involved are wasted. I was impressed with the real professionalism of the participants, most of whom had many years of experience carrying out prescribed burns. The Wisconsin Prescribed Fire Council is a relatively new organization but an important one for prescribed burners. It is now incorporated as a nonprofit, and will be applying for tax-exempt status soon. Prescribed Fire Councils are present in over 25 states. The movement began in southeast United States, where prescribed fire is critical in land management. There is now a National Coalition of Prescribed Fire Councils, to which the Wisconsin council belongs. One of the goals of the Wisconsin Prescribed Fire Council is to promote "right to burn" legislation for the state. The Council has also conducted two conferences, the last of which, in January 2009 at Stevens Point, Wisconsin, was attended by over 300 particpants. Another goal of the Council is to coordinate and conduct training courses on prescribed fire, including those that can result in certification. Those interested in the Council should access its web site and list serve. 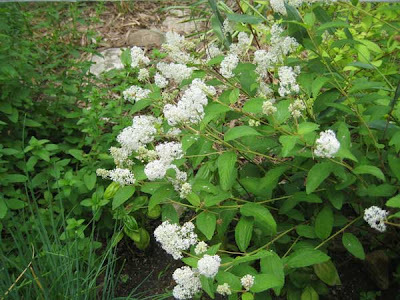 Lots of things are in bloom now, but two plants that are especially attractive are New Jersey tea and butterfly milkweed. New Jersey tea (Ceanothus americana) is found both in prairies and savannas, but at Pleasant Valley Conservancy it is mainly a savanna species. When we began restoration, the only place we had any significant number of plants was along shaded areas of County Highway F, where they increased extensively after we started brush control. There were also a few plants in an open savanna area among bur oaks. We collected seeds and planted them widely throughout the preserve. A few years later we started seeing them in flower, and now I am finding them all over. The photo above is of a new flowering plant I just found in Unit 19C, right by our service road. A "trick" with New Jersey tea is that the seeds don't germinate well unless they are given a brief exposure to boiling water. This is somewhat counterintuitive (don't plants die when they are heated? ), but the heat treatment must be very brief. Bring water to boil in a small sauce pan and throw in the seeds, swirl around until all seeds are wetted, and then quickly pour the mix into a food strainer. Immediately douse the seeds in cold water. They should be planted the same day they are treated. Butterfly milkweed (Asclepias tuberosa) is one of the most attractive prairie plants, and is now in full bloom in southern Wisconsin. This is mainly a prairie species and is rarely found in savannas. It likes dry to dry mesic sites. The best populations I have seen are at Black Earth Rettenmund Prairie, where they are visible even from the highway. Kathie and I have been managing this site for about six years and this year there are more butterfly milkweed plants than ever. The very favorable weather must be partly responsible, although I'd like to believe our extensive restoration work is also a factor. This is an easy plant to grow in natural areas, although it takes a few years when planted from seed. It can also be easily raised in pots and then transplanted to a site. Some plants may flower the next year after transplanting. According to Woodson, individual plants will live many years. 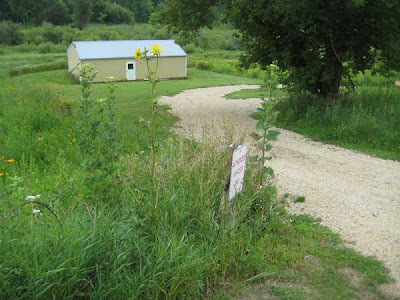 The photo here shows two plants growing profusely in a forbs garden that we set up at Pleasant Valley Conservancy. We also have a very nice patch in our home garden. In the City of Middleton, the median strip of University Avenue has lots of butterfly milkweed, which is flowering well at the moment. This is the time of year when the savanna grasses are blooming. These are so-called cool-season grasses, which flower earlier in the year than the warm-season prairie grasses. We have four species of savanna grasses at Pleasant Valley Conservancy, three ryes and one brome. Two of the ryes are flowering now: bottle brush (Elymus hystrix) and silky rye (Elymus villosus). Bottle brush grass is a distinctive grass that is dead easy to identify. 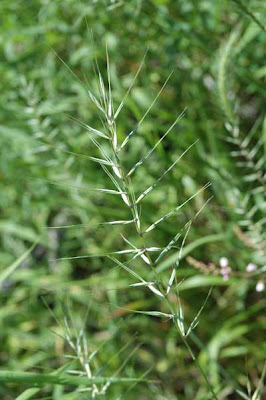 It used to be classified in its own genus, Hystrix, when it was called H. patula, but after it was found to hybridize with Elymus virginicus its classification was changed. 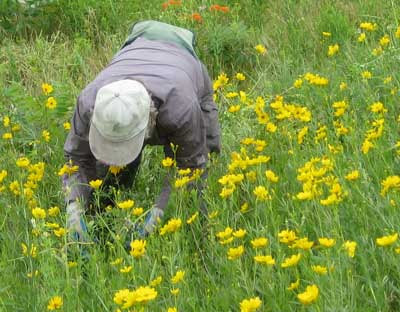 We originally had only a few small patches in open areas along our ridge trail, where we collected seeds. After we began savanna restoration, we created lots more habitat, and planted this grass (and the other savanna grasses) widely. It thrived, and as we continued opening up areas, this grass moved in. Now we have it in all of our savanna areas and no longer need to plant it. Although it does not burn as hot as the prairie grasses, it does contribute to a burn. I dug a few clumps and found last year's leaf bases present with charred areas from this year's burn. We usually plant these savanna grasses in swaths rather than broadcast them, so that we find patches here and there in the savanna. Along with many other cool-season grasses, bottle brush grass has a unique symbiotic relationship with an endophytic fungus that occurs intercellularly within the leaves and seeds. According to research by Keith Clay of Indiana University, the fungus symbiont enhances plant growth, reduces pest damage, and increases resistance to drought and other abiotic stresses. 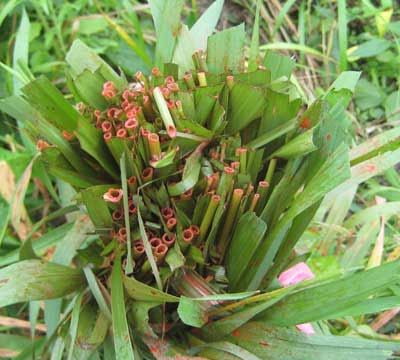 When the grass flowers, the fungus grows into the seeds and is hence transmitted to the next generation. Thus, the symbiont is transmitted from generation to generation via the maternal line, an interesting example of vertical transmission. My earlier post described the evils of sweet clover and techniques we are using to deal with large-scale infestations. However, it is also important to find the rare sweet clover plant that might have been missed. Why? Because any missed plant will likely flower and produce seeds which will be the source of next year's infestation. If we are going to eradicate a natural area of sweet clover we need to eliminate every plant. 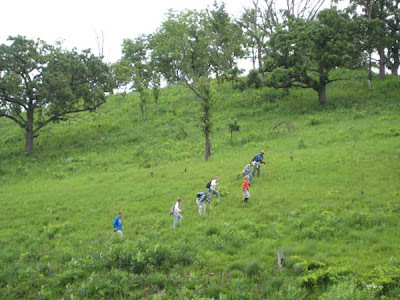 The photo here shows our interns and staff working across the south-facing slope at Pleasant Valley Conservancy. The approach is similar to what is used in a crime-scene investigation. A fairly tight line is formed which moves slowly across the site. Each person walks with head down, looking for the rare plant. Every plant is pulled as it is found. If a patch is found, the workers all coalesce and deal with it, and then return to their line. The leader, Heisley, in the orange shirt, stays somewhat out in front, maintaining the pace. When the end of the unit is reached, the line moves down, turns around, and returns. The search is continued in this way until the whole unit is covered. This time of year it is hard to realize that the prairie is predominantly grass. The commanding view is of wildflowers and the graminoids are not very prominent. In fall, on the other hand, the prairie seems to be almost nothing but grasses. The two photos are of almost the same location, one taken two days ago, the other taken a year or so ago in mid October. In the latter photo, there seems to be nothing but Indian grass. I find both scenes attractive, for different reasons. Black Earth Rettenmund Prairie is well known as an outstanding prairie remnant. Many people may not know that it is also heavily infested with sweet clover (Melilotus alba), one of the worst invaders of natural areas. As part of our management activities at Rettenmund Prairie, Kathie and I organize (and pay for) sweet clover control. Because this plant is a biennial, there are generally "good" years and "bad" years. This year sweet clover is especially bad. The principal control method is hand pulling. If you pull up the whole plant, root and all, you have eliminated it. The smaller plants can be easily dealt with this way, although it helps if the ground is moist. A strong person can also pull the larger plants, but weaker folks find it necessary to use a shovel. (The Parsnip Predator, a special shovel designed by the Prairie Smoke chapter of The Prairie Enthusiasts, works great.) The photo to the left shows Kathie pulling tiny sweet clover plants that are hiding among a nice patch of Coreopsis palmata. There is a lot of "stoop" work with sweet clover control! Unfortunately, Rettenmund Prairie also has large patches which are almost solid sweet clover. These could be pulled but the task would be really daunting. Mowing is the only solution. However, timing here is critical, since if a plant is mowed too early it will resprout, and if it is mowed too late, it will already have set seed. We have been monitoring the Prairie for the past several weeks and decided that now was the time to mow. Our friendly neighbor Dean Lucey (retired dairy farmer) kindly mowed some really large patches with his tractor. Yesterday, Heisley and Marci mowed a number of smaller (but still large) patches with Stihl brush cutters. As part of the mowing process, it is essential that the "good" plants be saved. 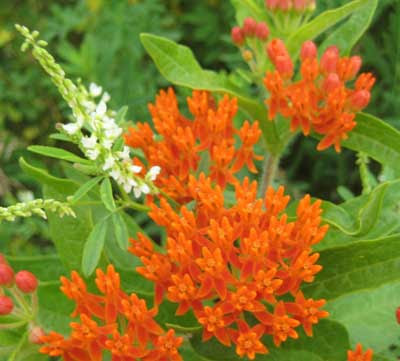 Especially now, when the colorful butterfly milkweed is in full bloom, it would be a shame to destroy it. The procedure here is to hand pull all the sweet clover "outliers", leaving only the solid patches for the mowers. 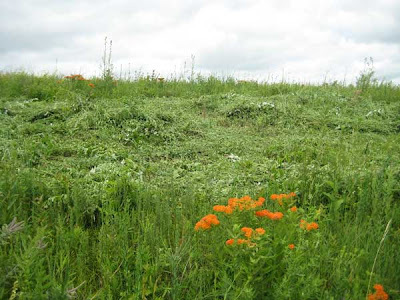 The photo below shows a mowed patch with butterfly milkweeds still intact. 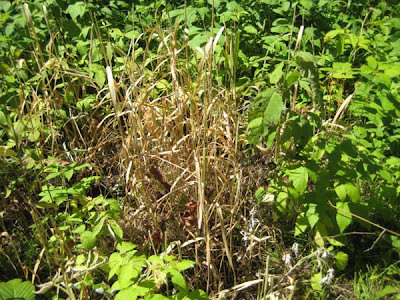 Since we have been controlling sweet clover at Black Earth Rettenmund for six years, why does it continue to be so bad? Several characteristics of sweet clover need to be mentioned. First, it produces seeds that are capable of remaining alive for many years in the soil. (Some sources say at least 30 years.) Second, seed germination is induced by fire. Throughout the 20 years or so that the Nature Conservancy owned Rettenmund Prairie, parts of it were burned every year, which would have stimulated seed germination. 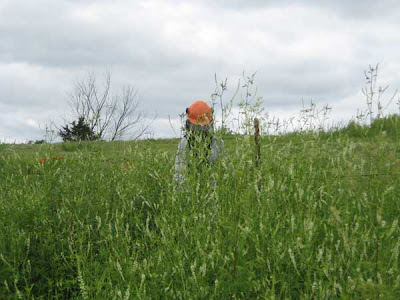 Although sweet clover control was part of the TNC management program, the infestation never seemed to abate. Since Kathie and I took over management of Rettenmund Prairie, sweet clover control has been one of our major activities. Obviously, we need to keep controlling sweet clover until we have exhausted the seed bank. Unfortunately, this may take a generation or two. A rather dismal prospect! Reed canary grass (Phalaris arundinacea) is rightly detested in the wetland areas where it most commonly thrives. However, it is not restricted to wetlands, but also lives in upland sites, such as savannas and woodlands. In these latter sites, it is generally found in smaller patches, although even here it can be troublesome. Craig Annen of Integrated Restorations has been taking care of our reed canary grass on both wetland and upland sites for about six years by spraying patches with sethoxydim in early June. At that time, you need a sharp eye to spot reed canary in the upland sites, because it is not flowering yet, and there are other grasses that look similar. Craig's eye is sharp, but he can't find all patches. By the end of June, reed canary grass is flowering abundantly, and is a lot easier to spot in the upland sites. But by this time, it is really too late to spray it effectively with sethoxydim, as there are lots of "good" grasses present. We usually deal with these upland patches ourselves, using a technique that is widely used across southern Wisconsin. 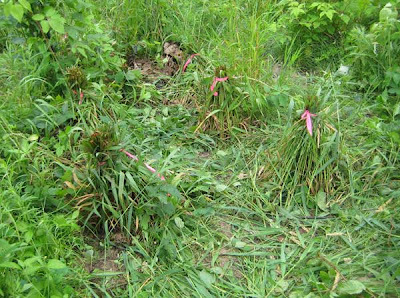 The procedure is to gather together as many stems as you can, tie them together with string, tape, or a grass sheath, cut off the tops just above the tie, and spray concentrated glyphosate (50% dilution of full strenth herbicide) down the stems. The herbicide is transported to the roots where it carries out its action. Within a week or so, the clone dies and turns brown. Yesterday, Kathie and I spent almost two hours dealing with a really large patch of reed canary grass that had invaded our white oak savanna. I had spotted some suspicious seed heads of this patch from a distance and confirmed that they were reed canary grass using the binoculars I always carry in the Kawasaki Mule. The patch was too big for one person to handle easily, so we worked on it together. Kathie gathered the stems together in large patches, we worked together to tie them, I cut the stems with a sharp clippers, and then we sprayed the herbicide down the stems. The photo belows shows what such a patch should look like in a week or so. Reed canary spreads primarily by rhizomes, but it also gets from one site to another by seeds, so we carried off all of the seed heads that we had cut, just in case there were any viable seeds. By being pro-active and getting all clones at an early stage, we will hopefully keep reed canary from taking over our upland sites.